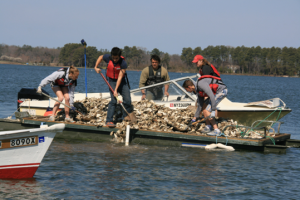 Oyster reefs have disappeared in the Chesapeake Bay because of overharvesting, introduced diseases, and poor water quality. Historically, reefs were huge piles of living shell near the water’s surface with non-living shell underneath. Because oyster shell is now in short supply, we are experimenting with other materials to determine if reef structure can be reestablished. 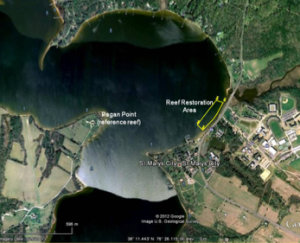 We are working with the St. Mary’s River Watershed Association (SMRWA- www.smrwa.org) and Rotary International to establish an experimental reef in shallow water along St. Mary’s College’s waterfront. Hannah Coe (SMCM 2013) examined the faunal colonization of reef materials for her SMP- St. Mary’s Project). Hannah found a greater faunal abundance in oyster shell, but no difference in faunal diversity among reef material types. 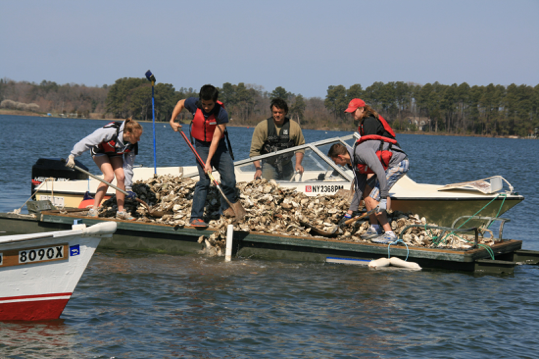 Elizabeth Lee (2013 SMP- St. Mary’s Project) studied oyster spat survivorship and growth on different substrates fall-spring. Liz found high winter mortality on all substrates, but oyster spat survivorship on oyster shell and concrete were roughly equivalent.